If funds come through, the building will rise again in what is now one of the city's most populous Muslim neighborhoods. The Fraenkelufer synagogue was designed in 1916 by the German Jewish architect Alexander Beer. BERLIN: Along a narrow canal in one of Berlin's largest Turkish and Muslim neighborhoods sits a synagogue's ghost - the site of a worship hall that was largely destroyed by the Nazis on the November night in 1938 known as Kristallnacht. Eighty years later, a Palestinian-born German politician and the leader of Berlin's Jewish community stood together on a recent morning outside the vanished building's single remaining wing and outlined a plan to give the ghost new life. If they can raise the funds, the two hope to completely rebuild the Fraenkelufer synagogue as a house of worship and neighborhood meeting place for people of all faiths and none. The aim, they said, is to send a message of comity and reassurance at a time when rising Islamophobia and fears of a new wave of anti-Semitism in Germany are deepening social mistrust. "Everywhere, people are trying to split our society," said Raed Saleh, a 40-year-old Social Democratic leader in Berlin's state parliament. "I wouldn't be a good Muslim if I didn't champion Jewish life in my home city, Berlin," he said. "And a Christian wouldn't be a good Christian, either, if he didn't intervene when a woman's hijab is being torn from her head." For Gideon Joffe, 45, chairman of the Jewish community in Berlin, reassurance is long overdue. The synagogue's old side wing is still used for services, but with the street closed off and guarded by police since unidentified assailants attacked it in 2000 and 2002. News reports of recent anti-Semitic incidents in Berlin's schools and abroad have intensified the community's unease. "Our members are afraid to show their Jewishness," Joffe said. "They don't wear the kippah," or yarmulke. "They don't wear the Star of David. They hide it. That's why we think it's really important to revive a building like this one." The fracturing of trust between the Jewish and Muslim communities is real, some experts say, but based in part on misperceptions. In Berlin, allegations of a new surge of anti-Semitism flared last month when German media outlets reported an increase in anti-Semitic attacks in the city. At the same time, far-right groups and the Alternative for Germany party have used such reports to fuel anti-refugee rhetoric, blaming the attacks on Muslims, said Juliane Wetzel, of the Center for Research on Anti-Semitism at the Technical University in Berlin. According to Wetzel, there is no quantitative evidence for either an upward trend in anti-Semitic attacks or Muslim culpability for them. In Berlin, although more attacks were reported last year, Wetzel said, it was largely because people are now able to report their experiences anonymously to the Department for Research and Information on Anti-Semitism, or RIAS, which began collecting data three years ago. "People are just starting to be aware of them," she said of RIAS. Nationally, the number of anti-Semitic attacks, which include violent offenses and hate speech propaganda, has remained fairly steady for a decade at about 1,500 a year, according to an Interior Ministry report. Ninety percent of those attacks are carried out by right-wing groups or individuals, the report says. Some studies suggest that anti-Semitic attitudes are widespread among Muslims who subscribe to authoritarian or fundamentalist interpretations of Islam. One pilot study, by Gunther Jikeli of the University of Indiana, found that anti-Semitism often accompanies opposition to Israel in Arab countries. Wetzel said that does not mean Muslims would necessarily act on such sentiments when they come to Germany. "Refugees we've spoken to show interest in learning about the Holocaust because they know that in Germany, where they want to live, the topic is of great importance and that German policy is based on it," she said. Jikeli, however, noted that German authorities categorize anti-Semitic incidents only as the work of the extremist right, the extremist left or criminal foreigners, ignoring religious affiliation. "There is no reliable data on the percentage of Muslim perpetrators in Germany," he said. "We want to send a signal that Jewish life is part of German dominant culture," he said at the plan's presentation. "You can only meet hate and discrimination by opening doors and reaching out." Joffe and Saleh, along with members of Saleh's party, came up with the idea of rebuilding the synagogue about five months ago, on the 80th anniversary of Kristallnacht, or the Night of Broken Glass - the Germany-wide pogrom of Nov. 9, 1938, when the Nazis and their supporters set fire to the building's interior, burned Torah scrolls and destroyed ritual objects. During the war, the shell of the structure housed military vehicles. In 1944, the Nazis demolished it completely with a bomb. Now, Joffe and Saleh told the crowd, the old side wing is getting too small for a growing Jewish community, and the neighborhood's diverse residents need a place to meet. After the Holocaust, when Berlin's Jewish population shrank from 160,000 in 1933 to 7,000 in 1945, new synagogues were not required. But in recent decades, immigrants from the former Soviet Union and Israel have revived the community and created a need for more space. The city - which has about 80 mosques and Muslim prayer rooms - has 11 synagogues in addition to Fraenkelufer. The Fraenkelufer synagogue was designed in 1916 by the German Jewish architect Alexander Beer, who died in the Theresienstadt concentration camp in 1944. Beer built several synagogues in Berlin, but Fraenkelufer, which seated 2,000 people, was one of the largest - and his most important work. "I wanted to honor Beer's original intention, so I kept many elements of his design," said Kilian Enders, the 43-year-old architect of the proposed new building. "This model is supposed to recall the old synagogue but show a clear break with the past," he said, pointing to a depiction of his plan for a grand hall with a crisp, white classical facade contrasting sharply with the weathered side wing, which would be preserved. "The scars and wounds of the past should be visible. You cannot, and should not, cover those up," he said. 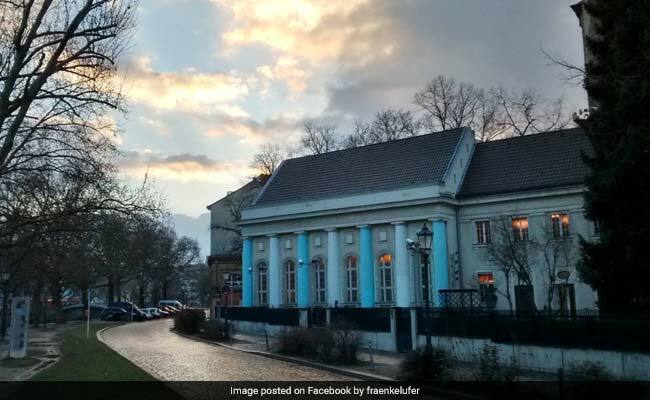 Mario Marcus, a 67-year-old retired surgeon who has attended services in the side wing - originally home to a youth synagogue - for almost 50 years, said more and more Jews are moving into Kreuzberg. "We don't have enough room here anymore," said Marcus, who married in the side wing and whose sons had their bar mitzvahs there. Marcus acknowledged that he notices tensions between Muslims and Jews. "Arabs who come to Berlin have heard their entire lives that they should hate the Jews and the Israelis," he said. Although he has never been attacked or harassed about his faith, he said, he also does not display it in public. "The problem is that we live in a reality that has nothing to do with the propaganda that Arabs grew up with," he said. "So we have to create opportunities for them to meet us and for us to reach out to them." The project, which will cost an estimated $31 million, is still unfunded, but Saleh and Joffe are seeking support from the city, foundations and private donors. Enders, the architect, estimates that if funding comes through, it will take at least five years to complete. But already, Marcus and his son Jonathan Marcus say, the effort carries profound symbolic meaning. "The possibility of a reconstructed building is hugely significant for us," said Jonathan Marcus, 37. "The last member of our community who remembered the old building died a few weeks ago. How do we make sure people remember now?"